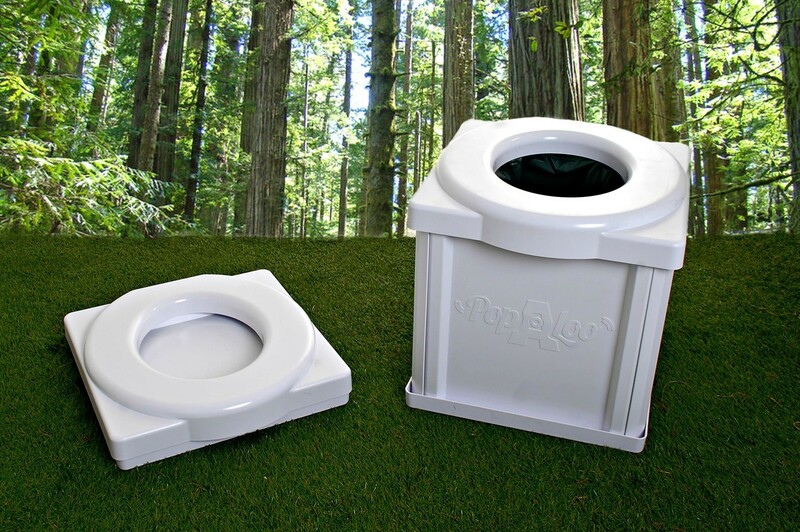 There are many types of portable toilets available, but nothing is quite like Popaloo and when you see the product and the benefits it offers we hope you will agree. Popaloo when closed is just 420 mm square and 90 mm high, the seat height when in use is 430 mm high,the same as your loo at home. Made of durable ABS plastic your Popaloo treated with care will last a lifetime. We also offer “The Private Convenience Tent" giving the user complete privacy when nature calls. Invaluable for various wilderness trips, building sites and to the festival goers.....No more standing in line. The Popaloo can be assembled in less than forty seconds and the tent’s in less than five seconds, this combined with the space saving features and functionality makes Popaloo a fantastic choice for a variety of users. The Popaloo is chemical free, it has a Bio Degradable dry powder bag system, the powder gels the waste, once finished simply knot the bag and dispose of responsibly, in a standard bin or compost area or depending on where you are, bury it! Once purchased the only ongoing costs are the Eco Powder bags. Popaloo portable toilet with ten Powder bags, Wet wipes,Toilet Tissues and carry case. How many times can I use the bag? This is of course a personal choice or decision. We obviously recommend single use, as the powder in the bag can only gel a certain amount of waste, usually 1.5 to 2ltrs of fluid and solid. We are aware of people using the same bag twice dependant on activity. 420mm square x 90 mm high closed. 420mm square x 430 mm high open. Just like to say I'm so happy I bought the Popaloo. We work at festivals all over the country and one of the problems has been the toilets. Popaloo has saved me from the midnight run to the often very smelly festival toilets. It's easy to put together and the nice thing is it's the right height so no awkward squatting. My husband who at 18st is very happy to use it. It's so easy to put together and solidly made too. Disposal of the powder bags is simple and discreet!! I'd just like to say what a great product this is. As a truck driverwho spends lng periods away from home, often in remote locations where facilities are often sparse or grossly unclean, this fits the bill perfectly for me. I'd been looking for a portable toilet for quite a while but storage of a normal camping toilet was an issue.... This Popaloo is great as it can be packed in its staorage bag and stowed away either behind the passenger seat or on the top bunk of the truck.